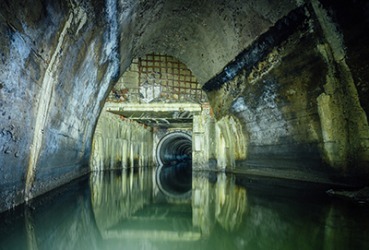 A sewer under the city. Sewer is defined as a set of pipes and drains to remove waste water and other waste materials. An example of a sewer is the drainage area into which home toilets feed. The definition of a sewer is someone who sews. An example of a sewer is a seamstress who makes repairs at a dry cleaners. "sewer." YourDictionary, n.d. Web. 16 April 2019. <https://www.yourdictionary.com/Sewer>. Middle English from Anglo-Norman asseour from asseer to seat guests from Latin assidēre to sit down ad- ad- sedēre to sit ; see sed- in Indo-European roots. From Anglo-Norman sewere (“water-course"), from Old French sewiere (“overflow channel for a fishpond"), from Vulgar Latin *exaquÄria (“drain for carrying water off"), from Latin ex (“out of, from") with aquÄria. (now historical) A servant attending at a meal, responsible for seating arrangements, serving dishes etc. From Anglo-Norman asseour, from Old French asseoir (“find a seat for"), from Latin assidÄ“re, present active participle of assideÅ (“attend to"), from ad (“to, towards, at") + sedeÅ (“sit"). A small tortricid moth whose larva sews together the edges of a leaf by means of silk. The city has a sewer-farm of S30 acres which the charter forbids it to sell. The finer clays, also, are mainly shipped from the state in natural form, but in the manufacture of sewer-pipe and fire-brick, Missouri is a very prominent state. It has various manufactures, including gypsum, plaster, oatmeal, brick and tile, sewer pipe, pottery, foundry and machine-shop products, and shoes. As far back as 1777-1799 the Georgsstollen was cut through the mountains from the east of Klausthal westward to Grund, a distance of 4 m.; but this proving insufficient, another sewer, the Ernst-Auguststollen, no less than 14 m.
The council may also complain to the county council that the district council have failed to sewer their parish or provide a proper water-supply, or generally to enforce the provisions of the Burial Acts; and upon such complaint, if ascertained to be well founded, the county council may transfer to themselves the powers and duties of the district council, or may appoint a competent person to perform such powers and duties.